THE IRISH PARACHUTE CLUB – operate from Clonbullogue, Edenderry, Co. Offaly. 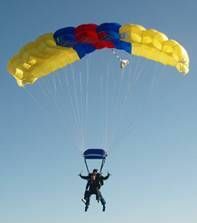 SKYDIVE 4 CHARITY – offer a choice of parachute centres – Kilkenny City and also Clonbullogue, Edenderry, Co. Offaly. Skydive 4 Charity also provides a complete service on behalf of Jack & Jill making the process of organising your charity jump easy for you: sponsor packs, online registration & sponsorship, liaise with the selected charity, skydive centre booking, full & transparent financial report. To qualify for a charity skydive please note there is a minimum fundraising amount required to secure your parachute jump – for further details contact your choice of provider or contact Jack & Jill on 045 894538. WITH YOUR SUPPORT THE SKY IS THE LIMIT FOR JACK & JILL!